This show aired shortly after Sayashi Riho’s graduation announcement so for the opening topic, Kanon gives her impressions on her impending graduation. First, it’s a very strange feeling for her, since it seems like it was a short time for someone to already graduate since the last one. But, Morning Musume is a rotating group, so there is constantly the thought of “Who is going to graduate next,”. Now that her generation are the seniors in the group it seemed likely one of her own would be next, but for it to be Riho, it leaves Kanon with uncertain feelings. At this point, it’s hard to believe.The 9th and 10th generation members plus Sakura are all pretty close, so it feels like when the time comes, the tears aren’t going to stop. Aside from that, it will be strange to only have 3 members in the 9th generation. Kanon hopes to make many great memories with Riho in her remaining time in the group. That aside, Kanon has a guest on her show today: Kudo Haruka! She has been requested to be on the show many times, so Kanon is happy to have her here. Haruka asks if she is the first person to be requested on the show, but no, that was Sakura. Oh well, Haruka is happy to be here anyhow. Moving back to Riho’s graduation, Kanon wonders how Haruka feels about it. Of course she was a bit shocked, but Riho was always very strong so Haruka thinks she will be fine. 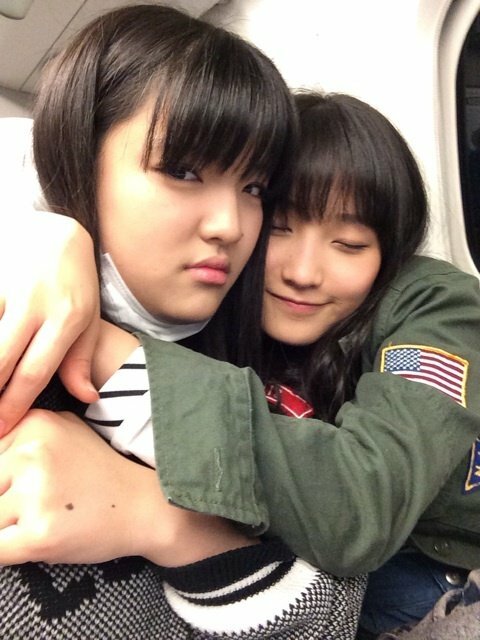 While the group is in “sad mode” right now, there’s no point in dwelling on it, so she hopes to move forward while cherishing her remaining time with Riho. Maria is back for this show and Kanon starts two off with a discussion on their latest single. Starting with Sukatto My Heart, Kanon mentions that at the beginning of the dance, Maria is part of the small feature dance at the beginning of the song. When Maria found out she was chosen for that part with the four other members who were part of the dance team in Oh My Wish, she was super surprised and felt that she had to do her best no matter what. Moving on to Ima Sugu Tobikomu Yuuki, Maria-chan also has a solo part in this song. Initially, Maria thought for sure it would be a while before she received her own solo line because she isn’t very good at being precise with rhythms. But, she paired up with Riho to work on things she felt she was bad at. During their concerts, when Kanon saw Maria was improving with practice, Kanon thought “Wow, she’s working so hard!”, since, she felt that Maria seemed like the type to not truly listen but actually is always listening closely to advice. For Kanon, she received a main vocal part on Oh My Wish! for which she is very thankful to receive. Lastly, they both recommend everyone checking these songs out. The two that hail from Aichi are back! I, Suzuki Kanon Will Open Up To My True Feelings Message Corner! As far as name origin goes, originally Maria was going to be named Rikako but, because of some sort of circumstance she doesn’t really know about, her mother changed her mind. She named her Maria as it has a sense of “being loved by the world” and the last kanji in her given name is the kanji for love, which represents the “being loved” part. Kanon thinks that’s a pretty great origin story. She asks if Maria has had any stories to tell regarding her name. She’s a bit confused at first, but Kanon gives an example: when they were represented on a tv programs web page, she saw people seeing her name and commenting that the name had a wonderful feeling, ‘like that girl must be really loved’. Understanding, Maria expands on her parents thought process, revealing her parents thought about just representing her name in katakana or hiragana, but then picked kanji for the name instead. Also, the name also holds meaning in English, which was also a nice factor. Kanon has a special, super cute guest with her today: Makino Maria! Maria is very happy to be on the show today. To start, Kanon thinks they’ll be able to talk easily since they’re both from Aichi, so she asks Maria what her favorite area of Aichi is. Since she went to there a lot as a child and used to be a fan of the Chunichi Dragons , she picks the Nagoya Dome . Although, now she is a fan of the Nippon Ham Fighters (located in Sapporo). Seeing Maria talk about baseball, Kanon can tell she’s really into it. Changing the topic slightly, Kanon wonders how Maria’s first summer break while being a part of Morning Musume has been. Overall, she’s been busy so Maria hasn’t done any of her homework yet, despite telling herself to do it. Instead, in her free time she’ll play games or goof off. Kanon scolds her for not doing her homework then tells her to do her best to make time for it despite being busy in Morning Musume. Suddenly, happy birthday starts playing, much to Kanon’s confusion. Maria manages a “congratulations” while Kanon continues exclaiming in surprise as the staff bring presents into the room. She thanks the staff, then Maria announces that she also brought something for Kanon. She is thanked profusely while Maria expands that her sister’s birthday was recently as well, so she purchased the presents at the same time. Finally, Kanon calms down, thanking everyone again, then starts to open the presents. From Maria, she receives a tissue pouch, handkerchief, and soap. Also, a pretty long letter, but she says she’ll read it carefully later. Moving on to the present from the staff, Kanon received a shaved ice machine and a fruit tart. She is pretty excited about it to the extent that Maria ends up starting the letter segment like they were orginally supposed to. After a moment, Kanon starts her statement with the thought that year 16th year was full of changes, and hopes for her 17th to be more stable, and hopes her fans will enjoy watching her growing into a more stable person. Immediately after she continues to thank Maria, saying she was really surprised. They then move into the real letters corner. Erina is back this week as the guest! Kanon suggests that since there hasn’t been time yet on the show, they should discuss how their GRADATION Budokan performance went. The two share that they were both a little envious of Riho and Sakura receiving so many of Sayumi’s previous lines, but were happy to receive a few of their own. Erina’s favorite line she received is in “I’m Lucky Girl”, which was sung as a 5 person song with Mizuki, Erina, Haruna, Haruka, and Kanon. The line “kono mama kaze ni notte” is in the chorus, which made Erina especially happy, since it was nearly the first time she sang in a chorus at Budokan. Kanon shares the feeling, finally getting to sing on her own, in particular, her solo part in “Shouganai Yumeoibito”. To them, who have rarely gotten solo lines in the past, can really feel “god looking down on them” when they do receive the parts. With that, they feel that they absolutely must perform their parts as well they can, and, beyond that, they think they were more nervous than other members who regularly receive solo lines because the pressure of judgement is certainly greater. Erina explains that she attempted to emulate how her seniors performed the lines; thinking it to be considerably difficult at first. The two are happy with how far they were able to grow during the GRADATION Concert season and look forward to doing their best during the Summer Hello! Concert, as well. 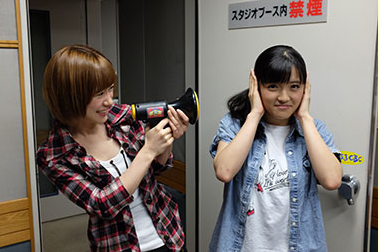 Today, Kanon has a guest on the show: Ikuta Erina! Kanon initially comments that she is of the opinion that most members stopped thinking about this show once Sayumi’s ended. Erina half heartedly replies that she had thought about the show, but that was the extent of her efforts. In her defense, the recording studio is ‘all the way out in Nagoya’, so it’s more of a out of sight, out of mind thing. She made it her all by herself today solely using her phones GPS though. This is Erina’s second time coming to the studio, as she ended up joining Mizuki when she went on as a guest on Sayumi’s show. When Sayumi announced her graduation, Erina asked who would be taking over the show, however Sayumi never gave her a straight answer. After thinking about it for a small bit, Erina concluded that it would probably be Kanon since the studio was in Aichi after all. Kanon mentions Maria is also from Aichi, and Erina says “Yeah I thought maybe it would her as well” since she had the new member appeal at the time. Tieing it together, Kanon states that she’s happy to have this show since it’s in her home prefecture. Normally, this would be the part where Kanon reads letters, however, they’ll be doing something a little different: a tongue twister showdown! The two cheer; Kanon begins asking Erina if she thinks she can perform tongue twisters to which she professes mid sentence that she think she can do it. On this radio show she has been able to do them before successfully, so while Kanon generally thinks shes bad at them, she thinks she’ll be alright today. Finding it hard to believe, Erina asks if she practices before the radio recording; this happens to be the truth, leading Erina to be suspicious of her real ability. The rules are simple, do the most tongue twisters without making a mistake and you don’t have to give a super-cutesy self appeal. The two rock-paper-scissors to decide who gets to goes first, Kanon wins. As a result, she lets Erina go first. Its already June 9th, Kanon realizes. She wonders what people’s impressions were from the recent Morning Musume Budoukan performance. Regarding this tour, the MC corner would have a rotating two people and they would talk about a given subject. This is the first tour since Kanon started her radio show, so she felt that she was better at speaking this time around. Before, when there was something she wanted to talk about during an MC her heart would race as she spoke, worried she wouldn’t say the right things during the discussion. However, because she is able to talk every week about what’s on her mind, she can separate what she should say as to what’s trivial during the discussion. So for this tour, she was able to properly plan what to say in advance. For example, on the radio show, she has been collecting postcards from Gifu prefecture and Morning Musume toured in Gifu for the first time in a long time. Because of the radio show, she knew what to talk about regarding the prefecture. Message 1: This writer asks if Kanon has any food and drink she likes to pair up. They like to pair taiyaki with roasted green tea. She doesn’t really have any, actually. Thinking for a moment, Kanon comes up with something. Although she can’t eat it right now, she really enjoys butterscotch flavored bread and will drink it with yogurt drinks. Kanon really likes sweet bread, the big and round kind that can be found at convenience stores. Erina likes it too, Kanon says. The staff asks for her to go into more detail on what type of bread it is. Struggling, she explains its like a brown, circular bread with a sweet coating on it. Essentially, when Kanon buys that sort of bread she’ll buy drinks like milk and yogurt, heavier things, and eat it with sweet bread. Its June, so that generally means Morning Musume will be involved in a stage play. Kanon has been in two stage plays thus far, Stacey’s Girl’s Re-killing Theater and LILIUM Girl’s Purity Theater. However this year she is not in one. Speaking of her previous stage plays, regarding Stacey’s, the story is about zombies and she remembers the play being very dark and that the expereince being strange for being younger at the time. With Lillium, the plot was about vampires. So first, she was a zombie, then she was a vampire. Therefore, she’s never been a human in a stage play. She’s not sure if the characters in Triangle, this year’s stage play, are human either, but she supposes they are. Kanon thinks its interesting to note that she has never been in a stage play as a human. She would like to, but of course she isn’t in the play this year, so perhaps next year. Again, Kanon explains that she’s doing her best with her diet, and wishes her fellow members performing the play to do their best as well. 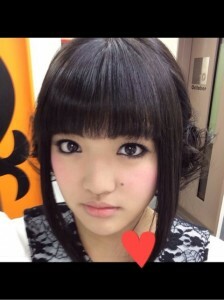 This past May, the 28th to be exact, was Sayashi Riho’s 17th birthday! Kanon and Riho both entered Morning Musume as 12 year olds.They are both now at what is considered the lovely age of 17, and it feels strange that so much time has passed. Kanon reminisces about the shooting of Maji de Suka Ska! : she notices now that Riho was already in the center during the jacket shooting and how that has progressed to her still being the center today. Riho is probably constantly worried about her being the center; being the face of the group and having a lot of pressure to hold on to is certainly a lot to deal with, Kanon speculates. Although Riho’s public character is cooler, when Kanon looks at her, she still thinks “Riho is pretty cute, though!”. She doesn’t show it in public very often, but Riho will occasionally start messing around and will get carried away with the silliness. Kanon thinks it would be great for the fans to see this, although she isn’t sure if Riho’s goofiness will ever become visible to the public.